Product #200 | SKU 1780-000-110 | 0.0 (no ratings yet) Thanks for your rating! 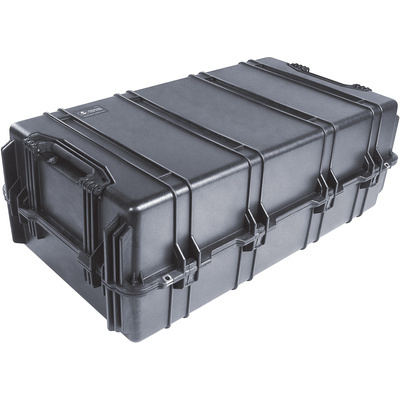 The Pelican 1780T Transport Case is an unbreakable, watertight, airtight, dustproof, chemical resistant and corrosion proof hard case used to carry any kind of equipment that needs to be protected from the elements. It is made of ultra-high-impact structural copolymer, which makes it extremely strong and durable. It has a watertight 0.25" (6.4mm) neoprene o-ring that seals perfectly, and includes an automatic purge valve for quick equalization after changes in atmospheric pressure. It uses easy-open, double-throw latches to open and close the case, and a folding carry handle plus four strong polyurethane wheels with stainless steel bearings, to transport the case. The case has been tested to meet Def Stan 81-41/STANAG 4280 specifications. This case has a Pick 'N' Pluck foam insert included. Unbreakable, watertight, airtight, dustproof, chemical resistant and corrosion proof case made to carry heavy equipment. The case is made of ultra-high-impact structural copolymer, with open-cell core wall design, which makes it extremely strong and durable. Built-in, Automatic Pressure Equalization Valve protects the case from changes in altitude or temperature. Watertight 0.25" (6.4mm) neoprene o-ring seal.